(1) New Issue! We have finally finished layout for our November/December issue, which is our 40th-anniversary issue (see retrospective cover above). Two articles are posted: Arthur MacEwan’s “Ask Dr. Dollar” column on global inequality, and John Miller’s “Up Against the Wall Street Journal” column on climate change. Table of contents here. 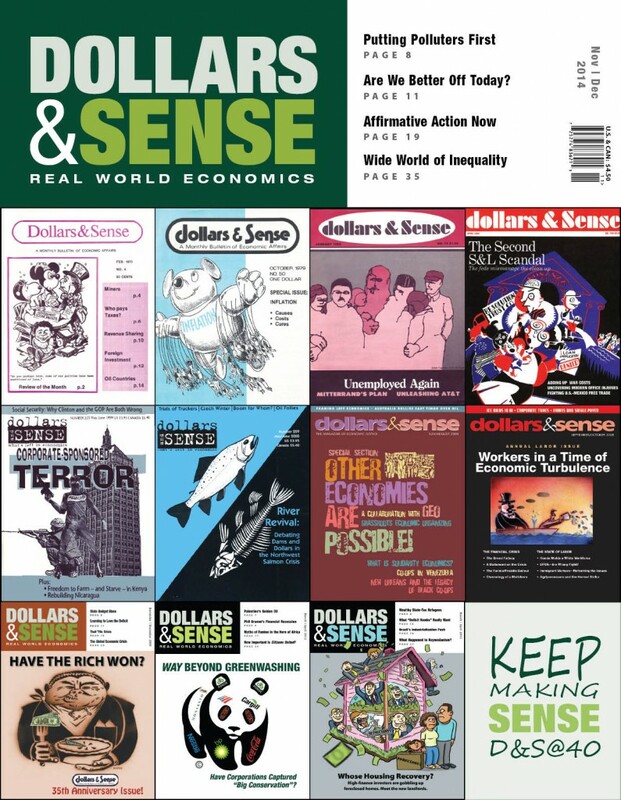 Look for more great articles from this issue online soon, including D&S collective member and economist Zoe Sherman’s piece, “Are We Better Off Than 40 Years Ago?” But why not subscribe? (2) LA Hotel workers: An inspiring story of a minimum-wage victory for hotel workers in Los Angeles (hat-tip: Jerry Friedman): The Fight for $15.37 an Hour, by Steven Greenhouse. (3) GOP Immigration plan: Hilarious Andy Borowitz piece from The New Yorker about the GOP’s comprehensive immigration plan: GOP Unveils Immigration Plan. (4) Gruber-gate: Naked Capitalism had good coverage of Obamacare shill Jonathan Gruber’s several anti-democratic/technocratic/econo-arrogant gaffes: It Couldn’t Happen to a Nicer Shill.